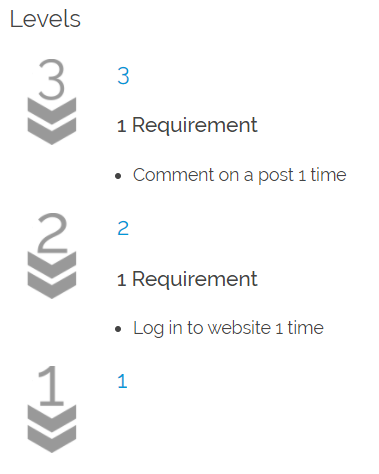 Let’s to see a real world example of a rank type creating and configuring the Level rank type and awarding levels to our users for logging and commenting on a specific page. Also let’s to see how to announce to the user the existence of this levels, the requirements to earn them and finally a page with the current level rank. Access to your WordPress admin area, normally located in your_site_url/wp-admin.Navigate to GamiPress -> Rank Types menu (This view is really similar to the WordPress post/pages views). At the top of this view you can find a button to add a new rank type. 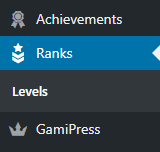 If everything went well, a Ranks menu with the Levels sub menu should appear before the GamiPress menu. Unlike achievement types, rank types has a different workflow. When you create achievements of an achievement type, user can earn any achievement just meeting the achievement requirements. Rank types adds a new “hidden” requirement that an user needs to meet to start completing any rank requirements: The user needs to complete first the previous rank. Ranks order is set by the priority field and his workflow is similar to the WordPress page’s menu order field. This will be our first level with a priority set to 1. 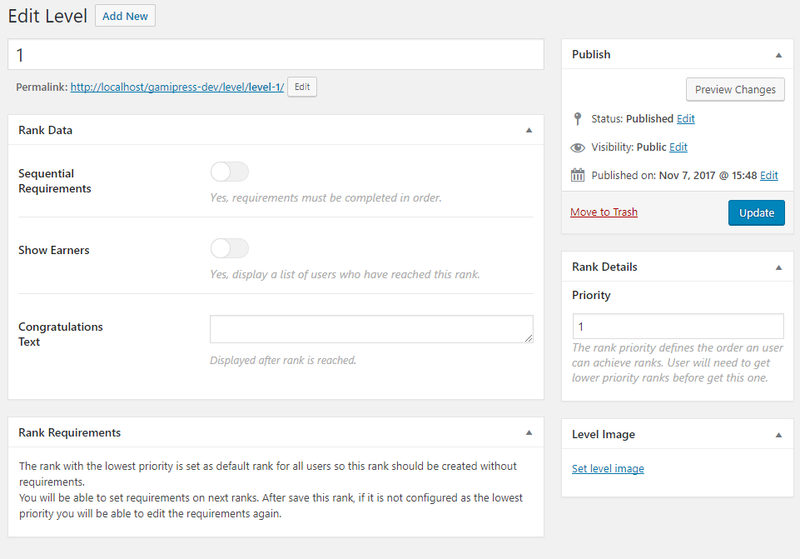 GamiPress set as default rank the lowest priority rank for each rank type, so the first rank will be created without requirements. As you can see, GamiPress will set by default the next priority based on the highest priority registered. How our highest priority registered is 1, GamiPress set next priority to 2. Also, the rank details box will add links to the next and previous ranks to let you access them easily. For more information about setup ranks, see the Rank Types documentation page. 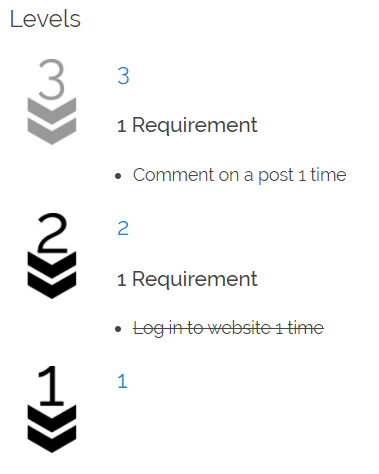 The unique way an user could earn this rank is performing the actions configured on the rank requirements. This requirements are located on the rank edit screen (after the “Rank Data” box). 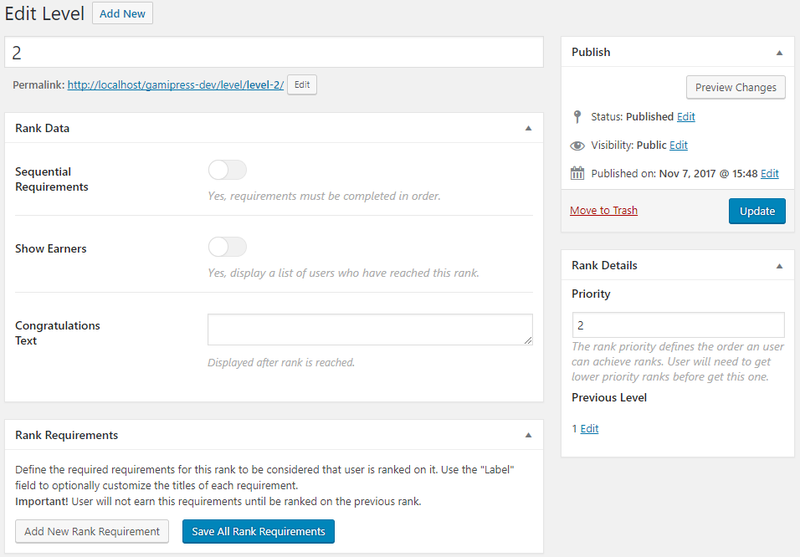 Clicking on the Add New Rank Requirement button you can add as many requirements as you want. As you can notice on the screenshot, if the user has completed all the requirements, the rank will look different. 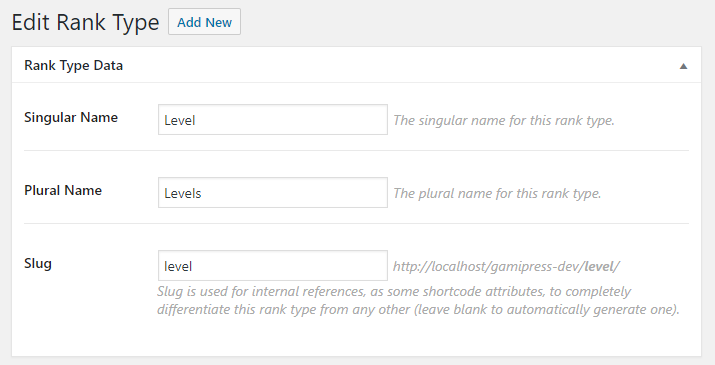 Note: Also you can show just a rank using the [gamipress_rank] shortcode or adding a link to the rank itself like you can do with a WordPress post/page.